I have learnt alot in the year 2013. The main thing I have learnt is that helping others is more important than helping yourself. I was invited to give a speech at the opening of Poster for Tomorrow at PUCE Santo Domingo. Received a copy of CMYK Magazine Issue 54 were I was featured as the Rising Star. Dead Leaf was in Berlin, Germany as part of the 3 year anniversary of Mut zur Wut. I was invited to be part of the International Invitational Poster Festival 2013 in Turkey. 7 of my students were selected for Peace in Syria ‘AUX ARMES CITOYENS in France. Also my poster was selected for the event. Designed the logo for the music band Tiny Lions in Northern Ireland. Went to my first Ecuador football match with Viviana were they beat Paraguay 4-1. Going on the Teleferico with Viviana to have a amazing view looking over Quito and walking literally amongst the clouds. Going to the Cromia event in Cuenca were I had 2 of my posters. My student Santiago Peralta was selected for Posterheroes 3 in Italy. Pencil wire was selected for Innovation in Education in Turkey. A Safer World Without Guns was showcased in San Francisco, USA. Pencil wire was selected for 2nd edition of Una Mano por el Diseno in Venezuela. Went to a skype video conference of Milton Glaser at the IAVQ. Received the Golden Bee 10 Moscow Global Biennale of Graphic Design book which included my selected poster See with heart. 6 of my students were selected for VIKSUAL International contest in Colombia. Female Surrounded has it’s 125th exhibition in Paris, France. Music Nature was selected for the International Reggae Poster Contest 2013. My student Santiago Peralta was selected for Mut zur Wut 2013 top 100. Dead Leaf was selected as the Public’s 1st choice winner for Occupy What’s Next? Invited to be included in Issue 7 of Limme Magazine. Dead Leaf was selected for the Green Patriot 2014 calendar. 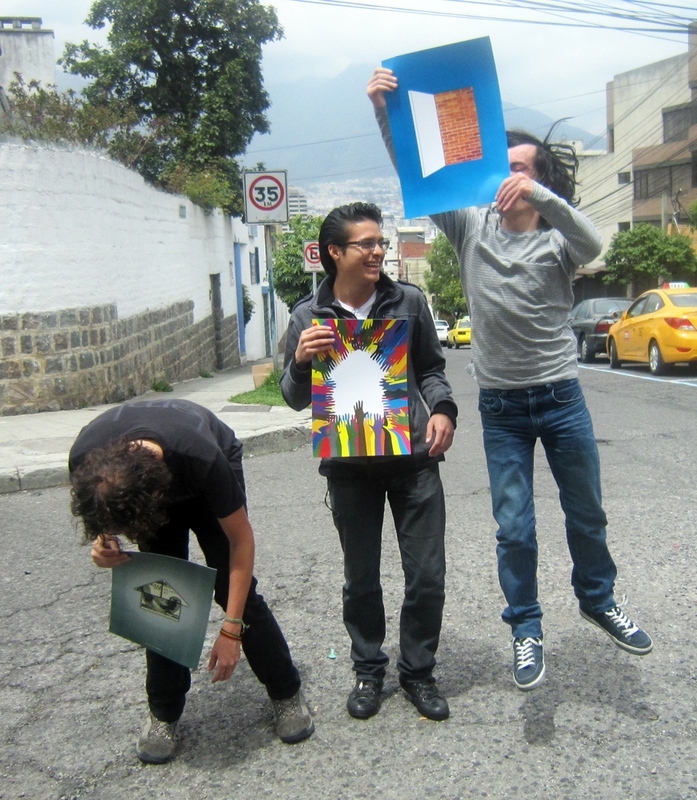 3 of my students were selected for the 6th International Poster Exhibition Pachamama in Lima, Peru. Mother earth and Earth love were also selected for the 6th International Poster Exhibition Pachamama in Lima, Peru. Invited to be part of the online jury for Poster for Tomorrow 2013. Invited to be part of the jury for the 2nd Vibre Poster Festival in Iran. 2 of my students were selected for Escucha mi voz in Mexico. 2 of my posters were selected for Escucha mi voz in Mexico. Going to the Virgen del Panecillo to see the contrast of the North and South of Quito. My student Santiago Peralta was selected for the International Student Poster Biennial 2013 in Poland. Also 3 posters I created 2 years ago during my Masters were also selected. 2 of my posters were selected for the 3rd International Art Festival of Resistance in Iran. Invited to have 2 of my posters (My home and Life) to be part of the Arts Move 2013 in Poland. Invited to give a skype conference at the CETYS in Mexico. The film by my students was selected for the 90SecondCity Film Festival in Northern Ireland. Visited the conference Diseno Agente de Cambio 2013 in Lima, Peru. 3 of my students were selected for Creacartel Concurso de Carteles 2013 in Venezuela. Cross crescent battery was selected for Creacartel Concurso de Carteles 2013 in Venezuela. My student Santiago Peralta was selected for Segunda Llamada 2013 in Mexico. Invited to design a poster for the 100 años de José Gaudalupe Posada in Mexico. 8 of my students were selected for the 2013 Busan Design Association 40 Anniersary in South Korea. Earth love was selected for the 2013 Busan Design Association 40 Anniersary in South Korea. My student Santiago Gómez was selected for the 6th Skopje Poster Citizen 2020 in Macedonia. Invited to give a conference at the IAVQ. Designed the logo for Banana Spanish School in Quito, Ecuador. Went to the III Concurso Nacional de Afiches with my student Santiago Gómez. Invited to have some of my posters at the International Poster Exhibition Korea 2013. Created my new logo based on my hair. Selected for the COW International Design Festival 2013 in Ukraine. Mentoring my students in the Condor de Oro 2013 in Ecuador. Sharing a beer with some of the most talented Poster designers in Ecuador. 2 of my students (Santiago Gómez and Cristian Rodríguez) were selected for Poster for Tomorrow 2013. Brick door was selected for Poster for Tomorrow 2013. Setting up an Instagram account. Went to a skype video conference of Wally Olins at the IAVQ. Hopefully spending Christmas and New Years with Viviana. The main highlight of this year was when I was told I was selected for Poster for Tomorrow but when I notified that 2 of my students were selected also it was even more emotional and I can admit a few tears were shed. I end with some advice for the new year 2014…If you do not believe you can do something then you will not be able to do it. Have a wonderful Christmas and New Years with your family and friends.